JUAN GONZÁLEZ: We turn now to the U.S.-Mexico border, as Defense Secretary Jim Mattis travels to McAllen, Texas, today to visit some of the thousands of troops deployed there by President Trump. Nearly 6,000 active-duty troops are currently stationed in Texas, California and Arizona, following Trump’s escalating attacks against the Central American caravan heading toward the U.S. in the run-up to the midterms. Trump has warned that the number could swell to 15,000—more than the U.S. forces in Afghanistan and almost triple the number of troops in Iraq. According to some reports, the border deployment could cost $220 million, despite the fact that the Pentagon does not see the caravan as a risk. A few hundred migrants from Central American caravans have arrived in the border town of Tijuana Tuesday as the vast majority is still at least 1,000 miles away from the U.S.-Mexico border. Well, for more, we’re joined by two guests. Here in New York, Fernando Garcia is with us, the founding director of the Border Network for Human Rights, an advocacy group based in El Paso. And in Pharr, Texas, we’re joined by Liz Castillo, immigration reporter, managing editor of Neta, a community news outlet in the Rio Grande Valley. She has been speaking with asylum seekers on the bridges and to the volunteers who are helping them. We welcome you both to Democracy Now! Fernando, I mean, the lead-up to the midterms, one action on the part of Trump after insult, whether he’s introducing an order that would ban all immigrants coming into the country outside of a port of entry, or talking about the caravans as invasions or invaders. Can you talk about what’s happening on the border? FERNANDO GARCIA: Yeah. Buenos días. Thanks for having me. Yes, yes. I mean, we had seen—at the border, we are seeing everything that you can imagine in terms of this racist, anti-immigrant not only rhetoric, but actually the strategies and agendas of the president of the United States. I just came from Mexico. I actually went to have a discussion with our colleagues there that are working with immigrant issues in the different NGOs. What I saw there was children, mothers and fathers and young people fleeing violence and persecution, fleeing poverty in Central America. So, that doesn’t match what the president is talking about, about bad hombres, criminals and demonizing that caravan. There is no such crisis of criminals coming to the border. The only crisis is the one that the president is creating by all of these things, because it’s not only, I mean, how he’s demonizing all of these refugees, but also it’s the construction of a border wall, the deployment of active-duty soldiers, which actually is setting up a very important precedent, probably even violating the Constitution of the United States in a very old provision, that is called the Posse Comitatus Act, that you cannot deploy the National Guard or the soldiers within the United States unless there’s an emergency, a national emergency, or there is a war. And nothing like that is happening in our border. So I think, obviously, this is a clear example of a distorted narrative being promoted by this president. JUAN GONZÁLEZ: And, Liz Castillo, I wanted to ask you—you’ve been interviewing migrants at the border. Could you talk about what you’re finding, their perspective, their viewpoint on why they’re coming? LIZ CASTILLO: By and far, the majority of the people, or everyone that we’ve been talking to, really, has cited poverty, has cited threats of persecution, cited fear of safety in their country of origin, and that is the reason that they are coming here. And we’ve been talking to asylum seekers since mid-June, when the “zero tolerance” policy first started. And since then, we’ve continued to witness an ongoing flow of people coming to the border, continuous groups. It started with smaller groups, but we’re continuously viewing larger and larger groups. At this point, we never really see a group that’s smaller than 20 people, at any given bridge, but the average is usually far larger than that and made up of families, made up of children, sometimes younger than a year old. We’ve seen people on the bridges who have medical conditions, including a teenager just this past month that had epileptic attacks on the bridge. And what we’ve seen is that, whereas at the beginning of the summer there were people who were only waiting there for maybe three or four days, which, in and of itself, is a really hard and testing amount of time to be living on an international bridge, what we’re seeing now is far larger waits, with people—no one that we’re running into at this point is waiting less than seven days. And we have some people telling us that they’re waiting two weeks. We met some people who say that they have been waiting on the bridges for a month and more, particularly folks who are coming from African countries, which is something that my colleague Morgan Holmes has been closely following and reporting on. JUAN GONZÁLEZ: And, Fernando, the whole issue of why so many people are coming from Honduras? Most Americans are not paying attention to what’s been happening in Honduras over the past few years, the United States government’s involvement in supporting what’s considered an illegitimate government at this point there, and also the constant deportation from convicted felons who come out of prison who are from Honduras being sent back constantly to reinforce the gang violence there. FERNANDO GARCIA: You know, that is true. And sometimes we are reluctant—and I say, as a society—to see what are the impacts and the effects of our U.S. policies in Central America, in the rest of Latin America, as a matter of fact. I think there are two things that are very, very important to say in terms of the U.S. involvement. The first thing is the so-called trade agreements. I mean, even the one that they are negotiating with Mexico and the one they had negotiated with other countries, especially in Latin America, those trade agreements are not producing jobs, at least jobs where people can live with dignity, have housing, healthcare, better salaries. That is not happening in Central America. So, there are reasons for people to leave because of those living conditions. The second thing that is very important is that there is this violence. I mean, we’ve heard about gangs, about killings in Mexico, but also in Central America. Guess what. Guess where they are getting the weapons from. From the United States. I mean, again, you have bad policies, bad economic policies. At the same time, most of the weapons where people is killing with in Central America are coming from the United States. And we actually are closing our eyes to actually discuss those issues. If we don’t want immigrants to come—let’s say for a minute that that’s the goal—I think the United States would have a great opportunity to implement some kind of Plan Marshall to elevate the living conditions in Central America, having a decent salary, decent housing, healthcare, so people will not have to come to the United States. But that is not happening. We are attacking this issue of immigration as an enforcement issue, or, in the worst case, as a military issue. I mean, this is the ultimate scenario. This is the picture of America today: soldiers at the border preparing to actually defend the country from children, from mothers, from immigrants, from refugees. I mean, how come we got to that point? AMY GOODMAN: Liz Castillo, can you talk about military exercises on the border? I mean, there are now thousands of troops, and thousands more U.S. troops that are being sent to the border. The cost, I think, is something like—now it’s being estimated it’s something like $220 million. LIZ CASTILLO: Yeah, it’s shocking view for people who are from the valley. We’re watching people in full riot gear with their helmets, with their guns. And they seem to be conducting what can only be described as worst-case scenarios. And it seems completely out of touch with the actual people that we’ve met on the bridges, which, again, are women, are children, are elderly people. And so, there’s this real, tangible fear that is coming from not just the drills and the exercises on the bridges and the messages that other law enforcement agencies are sending, including local agencies, which are saying things to the effect that they are ready with armored vehicles and that kind of thing, but also the effect that is cast upon people when they see military Humvees driving on the highway, or when they go to the Walmart or the local Sam’s and there are social—active-duty troops in, again, full helmets and full gear shopping next to them. I think there’s been a really dramatic increase in militarization within a really short span of time. We’re talking about just within, you know, the last two weeks. And so there’s a real fear in the air, and there’s a tension, and there’s a concern, given just the history of Border Patrol, particularly this year, but also beyond this year, really, when it comes to responses, disproportionate responses, to things such as rock throwing, that it might not even take that, that it might not even take a rock for the first bullet to ring, just based on the tension and the message that is being sent and the way that people—that law enforcement agencies seem to be preparing for what is a refugee caravan. JUAN GONZÁLEZ: And, Liz, we just have a little bit of time left. What about the children that are still in U.S. custody who were separated from their families, still 171 children, despite a months-long judge’s order to reunite them with their families? LIZ CASTILLO: I mean, I think it just speaks to this broader effect that is playing out at the border, also on the bridges, of a lack of a controlled and orderly process. I think that the Trump administration rule that went into—that was announced last Thursday is a great example of this sort of pattern of disorder and this willingness to ignore and to just pretend that there is order when there isn’t. What we’re seeing on the bridges is a process where people are taking two weeks or people are taking a month, where some people are being lost track of. And there is no orderly process at the border. People cannot go to a port of asylum and go through an orderly process and hope to be processed within a week, at least. So, it’s just emblematic of that. AMY GOODMAN: We have to leave it there, but I want to thank you so much for joining us, Liz Castillo, immigration reporter and managing editor of the community news outlet in Rio Grande Valley called Neta. And I want to thank Fernando Garcia. We will do Part 2 and post it online at web-exes. Fernando Garcia, Border Network for Human Rights, an advocacy group based in El Paso, he is the founding director. I’m Amy Goodman, with Juan González. Thanks for joining us. We are a 20 year old organization that fights for human rights. We recently held our fifth #HugsNotWalls event, where almost 400 families were reunited at the middle of the Rio Grand. 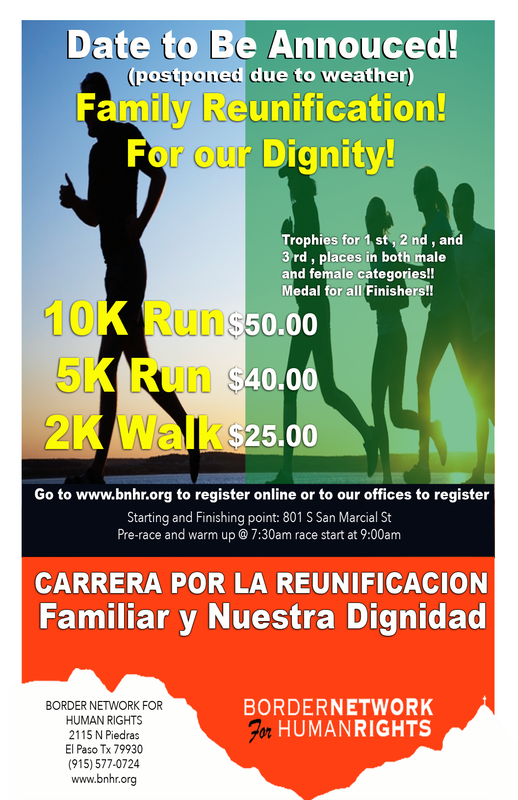 Please help contribute to the advancement of Human Rights and the reunification of families. Your contribution is very much appreciated, help us reach the goal of $50,000, we are close with over 25,000 already being donated by people like you. The Border Network for Human Rights, founded in 1998, is one of the leading human rights advocacy and immigration reform organizations located at the U.S./Mexico Border. BNHR has over 7,000 members in West Texas and Southern New Mexico. Carrera por la Reunificacion Familiar y Nuestra Dignidad!